Discussion in 'Canon InkJet Printers' started by Mike Minahan, Jan 14, 2014. Has anyone been able to refill PGI-72 Cartridges yet for Pixma Pro-10 printer. I so, how as any help would be greatly appreciated. I see there is bulk ink available on eBay, so I guess some folk are refilling. Yes is the answer to your question, I have refilled them many times using the dribble method and also my own method; I use them on my Pro 9500 and ix7000 printer. You’ll find dozens of threads on here for refilling the PGI-9 cartridge which are exactly the same cartridge as the PGI-72, just with a different label and chip on them and they are by far the easiest cartridge to refill by a country mile. Here are just two Videos on the dribble method. Based on my current testing of PGI-9 bodies on the Pro-10, the construction type appears similar but the internal specifications of the cartridge is not identical between the PGI-9 and PGI-72. The PGI-72 might work properly on the Pro9500 but my testing shows dissimilar feed characteristics on the Pro-10. So vice versa does not apply in this case. 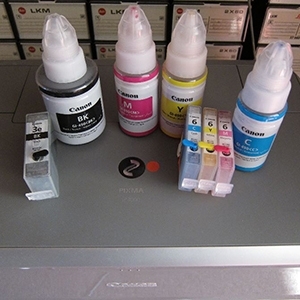 The Pro-10 printhead is not tolerant of dissimilar ink characteristics from OEM. It is very sensitive to the cartridge and ink properties. Adding to this my testing is also showing that ink that works perfectly well on the 9500 is not working properly on the Pro-10. YMMV so tread carefully. I will thus suggest to proceed with caution and very carefully test and observe the printed output and look for any signs of improper ink feed. It's hard to see to the untrained eye and will show up in certain printhead loading conditions. It will print BUT carefully check for proper ink ejection and feed characteristics. This has long term effects on the printhead. My introduction of the inkset for the Pro-10 is delayed until this small but important issue is resolved by ink formulation adjustment. Perhaps I'll wait a while. Does anyone know when suitable Inks and resetters will be available? Mikling would be one. He is the owner/operator of Precision Colors and has been working on an inkset for the Pro-10 as he somewhat cryptically (bashfully?) said in his post in this thread. Oh, I didn't know Mikling was Precision Color, thanks! I see you are in Australia. You have some fellow Aussie's on the forum and one guy who used to live in Australia for a spell. (Not me, I'm a Yank) Welcome! The British merchant counterpart to Mikling (Canada) for Image Specialists inks and refilling needs, including resetters, is forum member Websnail and his http://www.octoink.co.uk/ web site. Both are long time contributors to the forum and trusted e-tailers. The Hat and Emulator like this. All essential information Stratman, I think posts 6 & 8 need to be put out at regular intervals, they are key to the successful business of refilling. Perhaps info on other good inks should be added. Why not create an info page from these posts and anything else members think appropriate, that is always available for newcomers to view? It may need a bit of sprucing up since it was last updated.